of this world ... so the name is appropriate. Families rise early in the morning to flock to this beach to enjoy a full day in the sand and sun so if you want to enjoy this great beach, show up early and claim your spot. Are you wondering about the family member covered in fur from head to tail? Yep, you can bring the family dog! There aren't a lot of dog friendly beaches so people come regularly to play Frisbee and let Rover play in the water. Despite the frequent four legged visitors, the beach is still pretty clean and well maintained. Enjoy a day of lazing on the tan-colored sand while the kids catch some waves on their boogie boards and then top it all off with an evening cookout and picnic right on the beach. Bring your fishing gear and your “can’t fail” attitude because the fishing really is THAT good in Jupiter Florida! There’s even a long fishing pier open 24/7. If you can't sleep in the middle of the night, come on down and join the other insomniacs. The most popular area attraction is the Jupiter Inlet Lighthouse, which now houses a small historical museum where you can see shipwreck remnants and learn all about their history. The lighthouse was built in 1860 and is believed to be the oldest standing structure in Palm Beach County. Visit Dubois Park for a great view of the lighthouse where you can also picnic, play volleyball and just enjoy the beach. DuBois Pioneer Museum takes you into an 1898 Pioneer home that was built on top of an Indian shell mound. Kids of most ages: The kids will probably notice the surfers that frequent the beach and enjoy watching them do their thing. Why not take some beginner’s surfing lessons or get some boogie boards and teach the kids a milder form of surfing? Eating: Enjoy some tasty and classy seafood dishes at The Bistro or some yummy Caribbean creations at Captain Charlie’s Reef Grill. 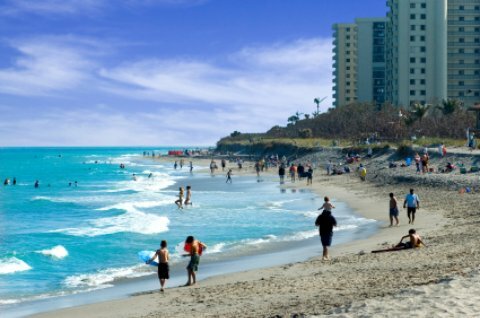 Sleeping: Enjoy a comfy stay in Fairfield Inn & Suites West Pam Beach Jupiter or live it up at the Jupiter Beach Resort.